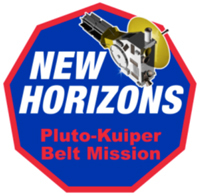 This is the New Horizons logo emblazoned on the payload faring of the Atlas V launch vehicle. What a blur this week is becoming. Every day includes three or four or five telephone interviews - yesterday it was The Economist, The Boston Globe, the LA Times, a French weekly, and the San Antonio Express-News. Resulting from last week's interviews, New Horizons is this week a two-page spread in Time magazine, it's on the cover of Aviation Week, and on Sunday (January 15) it will be the major focus of the next issue of Parade. Simultaneously, of course, there is "real" work to do. The launch vehicle is undergoing final closeouts on the launch pad at Cape Canaveral Air Force Station, Florida, and the final NASA Flight Planning Board has been held. Thursday will be the NASA Flight Readiness Review, which will be followed Friday by launch team communications checks, and then Sunday by the Launch Readiness Review. It's hard to believe, but in less than a week New Horizons should be millions of kilometers away from Earth, screaming its way outbound for the Kuiper Belt. As we approach launch, I am acutely aware of the team effort it has taken to bring New Horizons to this milestone. It took the pull of the scientific community, led in large measure by Decadal Survey chair Mike Belton, and the public, led by the likes of student Ted Nichols and Planetary Society director Lou Friedman, to unleash the funding we required. It took a Space Department at the Johns Hopkins University Applied Physics Laboratory, successively led by Tom Krimigis (2000-204), Mike Griffin (2004-2005) and Larry Crawford (2005 to present). It took a spacecraft team led by project managers Tom Coughlin (2001-2003) and then Glen Fountain (2004 to present) to design, build and prove out the spacecraft. It took a systems engineering team led by Dave Kusnierkiewicz and Chris Hersman, with the able help of Jim Stratton and Mark Perry, to guide spacecraft development. It took a payload team led by Payload Manager Bill Gibson and Payload Engineer Mark Tapley, both of Southwest Research Institute in San Antonio, to bring our seven-instrument suite from concept to reality. And it took an integration team led by Mike Colby to test our bird. It took a talented and dedicated Atlas team to build our launcher and a hard-working and equally talented Boeing-ATK team to top the launcher with a kick stage to inject us to Pluto. So too, it took a dedicated Department of Energy/Lockheed-Martin team to build, fuel, and test our spacecraft's radioisotope thermoelectric generator. And it's taking a tight-knit mission ops team led by APL's Alice Bowman to prepare us for flight. Of course, these people and organizations are just the tip of the iceberg. It took dozens of scientists and literally thousands of engineers and technicians from across the United States working together, as a team, to make the flight of New Horizons possible. To all the members of this team, the science team and the nation owe a great debt of gratitude. In four days time, we begin the countdown to launch the capstone mission to the first reconnaissance of the planets. 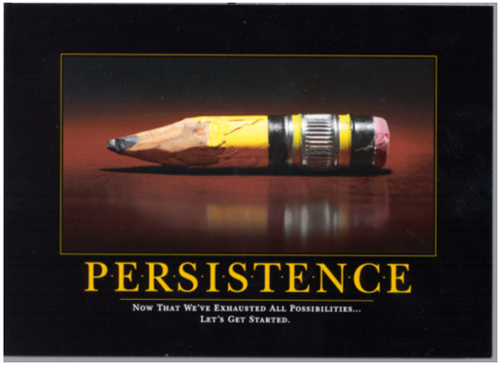 It is amazing what a dedicated team can do when it persists toward a dream.